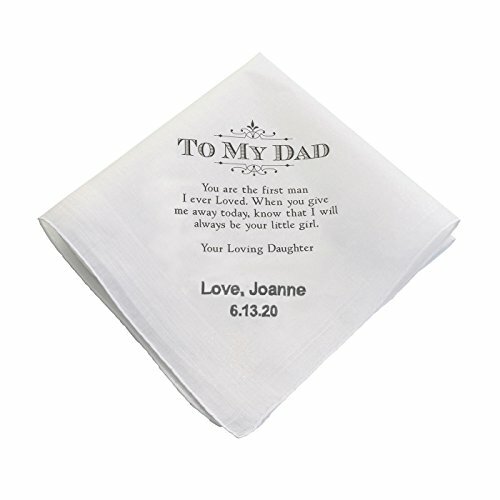 Surprise the father of the bride with a wedding handkerchief gift from his daughter - a sentimental keepsake that he will treasure long after your wedding day. With your name and wedding date embroidered in your choice of colors, you can coordinate with your wedding colors or choose a neutral. Perfect for all seasons and wedding themes. Your dad will surely shed a tear when you present it to him. EMBROIDERY DETAILS: Embroidered in block font; 2 lines of embroidery. Line 1 can contain up to 17 letters; line 2 is numerical date with periods between the numbers as shown in the photos; This will be a wonderful keepsake gift for dad!